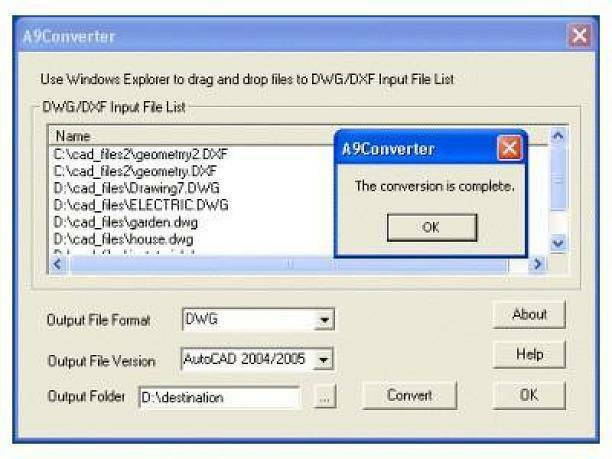 A9Convert is a command line program to convert DWG/DXF to different versions of DWG/DXF. It supports up to Autocad 2010. Standalone converter. No AutoCAD installation is required. Command line application. Can be used to script batch converting multiple files at one time. 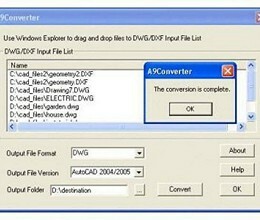 Perform version conversion among DWG files. Perform version conversion among DXF files. Read/Write AutoCAD R2. 5, R2. 6, R9, R10, R13, R14, 2000, 2002, 2004, 2005, 2007 and 2010. * A9Convert download link provides freeware version of the software. CAD File Converter's main purpose is to find its way among the various formats and versions of documents generated by Autodesk's AutoCad and by numerous other programs using DXF, DWG, DWF, DXB and PDF formats. A lite and fast dwg viewer, browse, view, measure, print DWG, DXF, DWF files. Supports AutoCAD drawing format from R2. 5 to the latest version 2013.
progeCAD is the low-cost CAD alternative which reliably edits DWG files from most versions of AutoCAD. progeCAD also uses toolbars, icons and commands similar to those used in Autodesk AutoCAD and AutoCAD LT.
A9CAD is a general purpose two-dimensional CAD program. A light CAD viewer for fast, precisely and conveniently opening CAD files. GstarCAD is well-known alternative CAD software of high compatibility with ACAD. No one has rated A9Convert yet. Be the first to rate this product. This program was designed to provide Civil Engineers and Land Surveyors with a quick way to calculate or check points on portions of a roadway profile, area calculations, drainage/flow calculations, traffic counts, etc. GeoRose is a program plotting rose diagram used in structural geology area. Civil / Structural engineering app that bundles information for the construction industry. DWG FastView is a cross-platform CAD software that meets designers demands in all kinds of situation, and fully compatible with AutoCAD. EngiLab Units is an easy-to-use yet powerful unit conversion tool for Windows. WinTopo is a high quality software application for converting TIF, JPG, PNG, GIF, BMP files and scanned images into useful vector files suitable for CAD, GIS and CNC applications.